Boxing legend Muhammad Ali will get hit by a devastating Irish one-two in Kentucky. And that’s because twin golfing sensations Lisa and Leona Maguire have qualified for September’s Junior Ryder Cup in his native Louisville. The teenage swing queens, 13, continued their amazing golfing exploits when Lisa won the European Under 16 Young Masters in Paris on Sunday with sister Leona in second place. And that earned the Irish pair automatic selection on the 12-strong European side for the Junior Ryder Cup clash with the US at The Club at Olde Stone from September 15-16. Proud Dad Declan Maguire said: “It’s probably the best golf they have ever played. The course par was 73 an Lisa shot a 69 on the last day to win by four shots from Leona. It’s been an incredible summer of achievement for the Cavan twins, who will celebrate their 14th birthdays in November. In March, Leona won the French U-18 title as Lisa reached the semi-finals of the French U-21 championship. The following month the plus-one handicappers helped Loreto Cavan win the All Ireland Schools title and Ulster to victory the Girls Interprovincials before Leona won the Hermitage Scratch Cup with Lisa fourth. 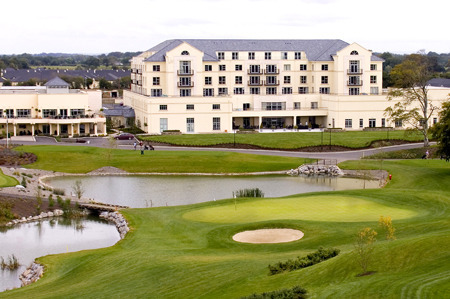 In May , Leona became the youngest winner of the Irish Ladies Close Championship when she beat Lisa in the final. But the roles were reversed in July’s Irish Girls Championship at Mullingar, where Leona was the leading qualifier but lost to Lisa in the decider. Twins sensations Lisa and Leona Maguire have been name in the Great Britain & Ireland preliminary squad for the next year's Vagliano Trophy matches. The Ballyconnell prodigies, who turn 14 on November 30, are joined in the 26-strong squad by Irish team mates Danielle McVeigh, Tara Delaney and Niamh Kitching. Twin teen sensations Leona and Lisa Maguire won’t be swapping the classroom for the pro game in time to make 2011 Solheim Cup on Irish soil. Twin sensations Lisa and Leona Maguire will get a chance to emulate Shane Lowry in next month’s AIB Ladies Irish Open at Portmarnock Links. Lisa and Leona Maguire contributed two points to the cause as Europe opened up a slender 7-5 lead over the United States after an engrossing opening day at the PING Junior Solheim Cup match at Knightsbrook Hotel Spa & Golf Resort in Trim, writes Colin Callander. 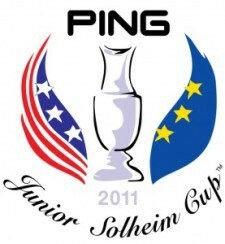 The United States of America retained the PING Junior Solheim Cup in dramatic circumstances when they came from behind to earn a 12-12 draw against Europe in an intense match at Knightsbrook Hotel Spa & Golf Resort, Co. Meath, Ireland, which was not settled until the last putt dropped. The visiting team trailed 7-5 after the first day’s foursomes and fourballs but won the singles by the same margin and retained the trophy as holders, having won the 2009 match at Aurora Golf Club in Illinois. It’s the first time that the home team has failed to win the match.